It begins with an innocuous-looking free-kick on the right touchline, far from Arsenal’s goal. Kyle Walker takes it and shares a couple of passes with Vincent Kompany as Danny Welbeck charges with intent after the rapidly shifting ball, content that if he and his team-mates do their job there is no immediate threat. Twenty-six seconds later, Manchester City have the ball in the net again. The third goal in City’s 3-0 win at Arsenal in March is just one of 93 goals Pep Guardiola’s side have scored on their way to being crowned Premier League champions with five games to spare this season. However, in its creation and execution, use of the ball, space and energetic, willing runners, it is symbolic of a side as lauded for its artistry as its efficiency. From Walker’s initiating pass to Leroy Sane’s decisive finish, six City players touch the ball, none more than three times in a single instance of possession, as the Gunners chase shadows around them. Walker, Kompany, Kevin de Bruyne, David Silva and Sergio Aguero share 15 patient but precise passes between them to set the trap, before the latter’s turn and acceleration away from Laurent Koscielny on halfway begins a rapid execution that is a masterclass of one-touch play: Aguero in-field to De Bruyne, out wide to Walker, into the middle for the arriving Sane. Thank you and goodnight. Its fluidity makes it appear simple. But this, and the majority of the 92 other league goals scored by City, represent many, many hours of disciplined, focused training, millions of pounds of expenditure and an unflinching tactical vision – “Juego de posicion” (positional play) – seeded last season and bearing fruit this term. The vast majority of teams aspire to keep and use the ball well when they have it and win it back quickly when they don’t. Pep Guardiola’s teams are no different, they are just better at it than most. They have recorded 11 of the 15 highest possession stats in a single game this season, averaging 71.23% overall, an increase on their 64.9% average from 2016-7. Thirty-one of their goals originate from winning or recovering possession in the opponent’s half, while 34 are from moves that start in their own. At every club he has managed – Barcelona, Bayern Munich and now City – Guardiola’s teams are instructed to play out from the back, a fact borne out in many of their goals and the average number of passes they have taken in the process of scoring them this season. Guardiola’s first high-profile move to this end last summer was to ruthlessly ditch goalkeeper Joe Hart and bring in Claudio Bravo to operate as a “playmaker keeper” (a term used by ex-England international Rachel Finnis-Brown in a BBC Sport column in October 2016). However, the Chilean keeper got steadily worse, in both his distribution and ability to stop a shot, until he was ditched in favour of Willy Caballero in February. Cue this summer’s signing of Brazilian Ederson, who has been a significant upgrade in every way. The speed, accuracy and vision of Ederson’s distribution plays a key role in this City side, as the goal graphics below show. City’s determination to play out from the back also places a greater onus on the defence to use the ball well. 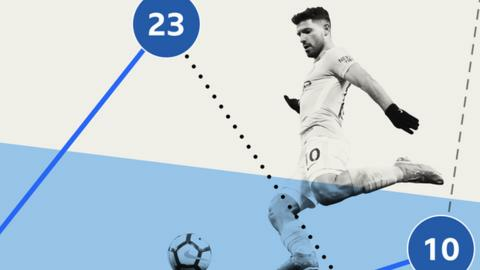 Guardiola was rewarded for resisting the temptation to buy new centre-backs in the summer through much-improved displays this season from Otamendi and John Stones, now more attuned to the demands placed on them. They have also benefited from the switch from an initial 3-1-4-2 to 4-3-3 formation, giving them better passing opportunities to the wing-backs, making Fernandinho a less isolated and more attractive option directly in front of them, and creating a more dynamic and threatening attacking unit for lateral movement of the ball, especially into the “half-spaces” (more on those later). Otamendi has made significantly more passes than any other player in the division, while Stones has the highest pass accuracy (96.26%) of any player to have made more than 1,000 passes in total. Otamendi (and his fellow City defenders) are not infallible, as Liverpool and Manchester United exposed in victories at Anfield and Etihad Stadium respectively by pressing and running at them persistently – something Palace also did to positive effect in the 0-0 draw at Selhurst Park – but this does not undo what has been a much-improved campaign. “Manchester City buy full-backs for the price of strikers.” This was the reason put forward by Manchester United boss Jose Mourinho in December to explain why his side could not compete with their fierce rivals in the Premier League. What this seemingly failed to appreciate was just how important athletic, skilful and tactically astute wide defenders are to Guardiola’s tactical approach and why he was willing to spend a combined £123.5m to acquire them this summer. Out went every senior full-back from the squad the Spaniard inherited and in came Benjamin Mendy (£52m), Kyle Walker (£45m) and Danilo (£26.5m). Walker has fully justified his price tag, bombing up and down the right side to often devastating effect. He has provided six assists this season, twice as many as all of City’s full-backs combined supplied last campaign. Judging by his superb display in the 5-0 home win over Liverpool, Mendy was on track to provide the same threat down the left until his season was ended by a serious cruciate ligament injury two weeks later. However, in Fabian Delph – a central midfielder by trade – Guardiola identified an unorthodox but highly effective replacement, one that fits nicely into his desire for his full-backs to be able to operate as effectively in-field as out wide to combat certain opposition tactics. Facing a side playing 3-5-2 and heavily reliant on their wing-backs to provide width, Guardiola had wingers Sane and Sterling press high up the pitch to occupy Alonso and Azpilicueta and stop them advancing. Delph and Walker move inside to provide defensive cover in central midfield, thus creating acres of space out wide for his most creative players – De Bruyne and Silva – to do the damage. The former duly did, scoring the winner. Only one team – Palace, back in December – have stopped City scoring in the league this season. Guardiola’s side have excelled at finding space in an opponent’s half and exploiting it. The final phase of De Bruyne’s winning goal at Chelsea takes place in one of what are called “half-spaces” – these are the channels between full-back and centre-half on either side of the pitch and key areas in Guardiola’s tactical approach. These half-spaces offer more passing options than the flanks and usually greater space than the middle of the pitch. Players in half-spaces create a major headache for an opponent’s defence, with defenders unsure as to who should be marking the man. The ability of De Bruyne and Silva to pick a pass means they can be devastating in these areas if afforded space, which City’s quick, intelligent build-up play and positioning is designed to supply. In Sane and Sterling, they have wide players with the speed, movement and intelligence to drive into these areas behind the defence to receive a pass or move inside, ahead of the back four, to create the space for the central midfielders or the wing-backs to overlap and deliver from the nearer the touchline. All these assists close to the corners of the six-yard box point to a certain type of finish to City’s goal scoring moves – one applied by an alert forward, in space right in front of goal. City have scored 17 so far this campaign from short crosses inside the box that are finished from close range. The likes of Aguero, Sterling and Sane are being served them on a plate. Every great team needs great players. Guardiola was fortunate to inherit many when he took over at City, and he has also undoubtedly improved several of his squad during his time in charge. However, by focusing on recruitment at the back in the summer he has markedly improved his side going forward. And he now has a title to show for it.